Sadako Sasaki (佐々木 禎子), who survived the atomic bombing of Hiroshima in 1945 when she was two years old, developed leukemia at age 12. She started folding origami cranes, following ancient Japanese lore that folding 1,000 cranes would grant a wish. According to her brother, Sadako folded more than 1,000 cranes before she died in October of 1955; cranes she folded have been donated to significant places, including Pearl Harbor in Hawaii and the 9/11 memorial in New York. After Sadako’s death, her friends and schoolmates raised funds for a memorial to all the children who died from the effects of the atomic bomb. A statue of Sadako at the Hiroshima Peace Memorial Park is accompanied by a plaque that reads, “This is our cry. This is our prayer. Peace on Earth.” According to the City of Hiroshima, each year approximately 10 million cranes contributed from around the world are displayed at the Children's Peace Monument. 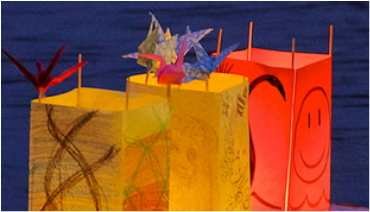 You can send your own cranes or join in crane making at the Peace Lantern Ceremony and have your cranes be among those sent from the Ceremony to the peace memorials in Hiroshima and Nagasaki.